There are times when having a second monitor can really boost your productivity. But investing in a dual monitor setup might not be a wise move. They are expensive and far for being portable. But, guess what, you can easily use your Android device to serve as the second monitor. All you need is the right app. If you own an iPad, you must have heard Duet Display – a popular second monitor app for iPad. Thankfully, Android has them too. We tested almost every second monitor app for Android on the Google Play store, and here are our top picks. So far we have seen how to mirror your Android screen to another Android and computer. In general, you need need to install a second monitor app on your Android and install the app’s drivers on your computer. Once done you can connect your Android to your computer, using a USB cable or WiFi (when both the devices are connected to the same network) and that’s it. You don’t need an Internet connection. So, let’s begin. spacedesk is a popular choice to transform your Android into a second display monitor for Windows PC. I like spacedesk because it works on LAN so you don’t need an active Internet connection. The setup is easy and works wirelessly. You can connect your PC and Android via USB, Wi-Fi or LAN. The resolution is decent and you also get touch support. To get started, you need to install the necessary drivers on your Windows PC. If you need further help, here is a link to the documentation. The app is available for Windows 7 and onwards. Opening the app will automatically detect and display all PCs on the same server that has the drivers installed. Simply tap to connect. 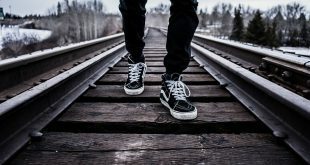 Launch the app on your Android and connect to your PC. The app should detect the IP address and name of your system. To use your tablet or Android as an extended display, you just have to configure secondary display option in Windows. To do that go to the Control Panel and then Display Settings. Select Extend These Displays and click OK. You should now be able to use your Android as an extended display. The most awesome feature is that spacedesk allows you to use 2 different websites or use 2 different apps on both the screens. spacedesk works well if you don’t want your phone to be bounded by a USB. But that’s the only complaint I have. Since it works wirelessly, there is a noticeable amount of lag. It’s good that you can switch to hotspot and USB. Splashtop Wired XDisplay, as the name suggests, will require you to have a USB handy. Other than that, it’s a good app and it does what it says on the tin. Unlike spacedesk, Wired XDisplay allows you to connect your phone only via USB. On the plus side, since you are connected by a wired medium, you get better resolution and frame rate. It supports Full HD resolution at 60 frames per second. Wired XDisplay can be installed on both Mac and PC, giving it an edge over Air Display. Mobile apps are available for both Android and iOS. Splashtop uses USB over WiFi for one simple reason – it offers a more responsive and real-time experience. There is no lag whatsoever. Other than that, the app works and functions exactly like any other screen mirroring app on the market. If you are looking to save battery, there is an option to reduce resolution and even frame rates. Because you are using USB, lag is minimal but still, it would be better if you have an option to connect over Wi-Fi. iDisplay is another display mirroring app on this list. iDisplay started with the macOS and iOS but quickly expanded to other Operating systems. You have apps for Windows and Android which makes it a good cross-platform solution. It supports 60 fps and plus offers multi-touch on the device you are using it on. The only thing is iDisplay is not free and it will cost you 18$. iDisplay has everything that the other app offers, with one caveat. USB support is not available for Android yet. It does support WiFi though and comes with multi-touch support but you don’t get USB. Other than this, there is really no difference between iDisplay and other apps save for the fact that iDisplay will cost you $18. The best thing about the app is that it does not limit mirroring apps by the operating system. Having said that, a USB support for Android would make it the ideal app for everyone. Well, Google Remote Desktop is more of a screencasting app. 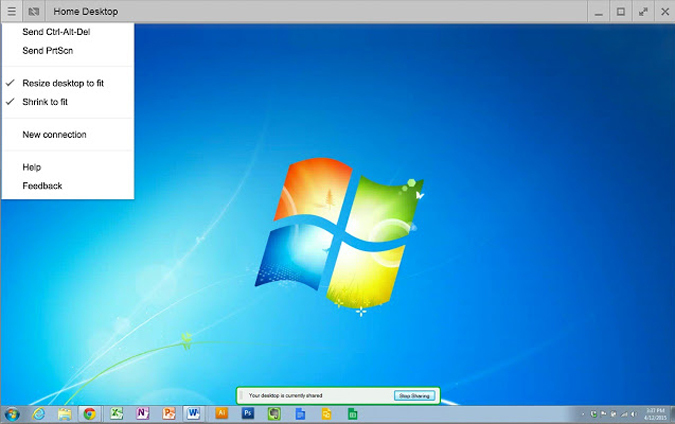 It’s almost similar to the native Windows Remote Desktop except that it allows establishing a connection between an Android and PC. It’s for people who are looking to mirror the desktop screen to your Android device. 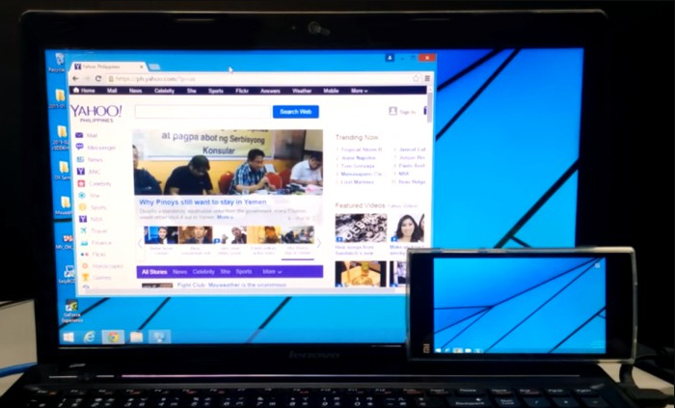 Like Remote Desktop, it also allows you to control your PC via your Android device. You can run commands on your PC from your Android phone. Basically, everything that you can do on your desktop can be done from the Android phone as well. Remote Desktop, like all Google products, is easy to use and simple to set up. You just need to have a working Gmail account. The ability to control your PC remotely is where it shines the most though. Google Remote Desktop works seamlessly but you cannot use separate apps on both the screen. It doesn’t let you use your phone as an extended display. Air Display 2 is another great screen mirroring app for macOS and Android. It works the same way for Mac the way spacedesk does for Windows PC but it comes with a price of 14.99$. 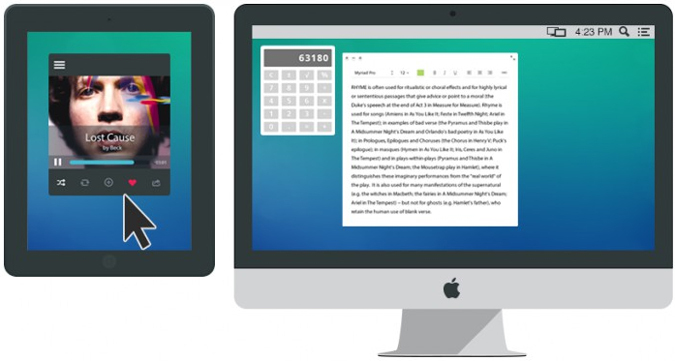 It turns your Android device into a secondary screen for your Macbooks. You can extend mirroring the screen to up to 4 secondary devices. On top of that, it also supports full HD displays. By all means, Air Display 2 (Air Display 3 in case of Mac) works and operates the same as Spacedesk. It supports all the way back to Mac OS X 10.8 or Lion. You can also use your PC as a secondary screen for your Mac. But it doesn’t work the other way round like you cannot use Mac or any mobile device as a secondary screen for Windows. I read the FAQs section and it says they are working on a solution, but it also says that they are not “close enough” to provide an ETA. On the plus side, it offers a more responsive experience thanks to the dynamic compression algorithm the team is using. It also supports retina display, something that is missing in Spacedesk. App also features Air Stylus which you can actually use the secondary device to draw designs on directly. Air Display works seamlessly but the issue is the pricing model. With every major upgrade Avatron Software i.e. 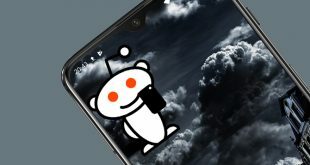 creator of Air Display increases the price. This is something which bothers long-time users like me but hey if money is not a problem then you are good to go. Another thing that bugs me is that you need to install Air Display Host on your iPhones, Androids, and PCs which you want to use as a secondary screen. But, Air Display can only be installed on Macs. So the cross-platform compatibility gets a little limited. If you recently moved from iOS to Android and you are looking for the best alternative to Duet Display, I recommend Spacedesk. It’s free, works as advertised and plays well with other platforms. Splashtop Wired XDisplay is a good second choice if you run into any sort of issues with spacedesk. And in case you are looking for more settings and better sync capabilities, the latter one is a better option for a small price. Also, if secondary displays are a part of your work routine, it’s better that you invest in one. Here is a 16″ portable monitor that you can buy from Amazon for 90$. Let me know how’s your experience with these apps and which one you ended up using for your devices.